Whew… being back in DC has been rough. It was FREEZING when I stepped off the plane last night, and they are saying lots of snow later today.. quite a 180 from where I woke up yesterday. While I try to adjust back to normal life, unpack, grocery shop, etc. (since I didn’t get home until after 10 last night), I wanted to share a photo with you guys that I recently came across of me “before”. I’m not sure if you noticed, but I added a few new pictures to the photos page (scroll down for the new ones). You see, the before photos I had been working with previously were pretty limited because my highest weight ever was during the archaic time before Facebook. Plus, I wasn’t exactly eager to jump in front of a camera during that time, so the pictures I did have were few and far between – mostly at weddings and other events where I had no choice but to smile for a photo. The easy answer is, that was me. This photo of me and my sister Wendy was taken several years ago, during a vacation in the Caribbean. I distinctly remember that tank top from Old Navy and remembering how “flattering” it was. The more complicated and true answer however, is I don’t even know. Yes, that was me, but I am such a different person now than I was back then that I barely recognize myself. My good friend Molly said to me, “Its funny because i remember you being a very happy person in college, pre-weight loss, but you don’t look very happy in this picture.” Ain’t that the truth. I think its so easy to put a smile on your face, tell a joke, and hide behind other people’s laughter so that you avoid what is really eating at you. For me, it was the fact that I was obese, bordering on morbidly so. Every once in a while, though, a photo will get taken that will show the true you. If it’s any indication, I never smile a genuine smile without showing some teeth. Seeing that photo reminds me of why it brought tears to my eyes to see “Health Hero” next to my name in the article from two weeks ago. The above photo was me for 24 years of my life. I’ve only been this “new” person for 2 years so I’m still adjusting, yet I can barely even remember what it was to be that heavy. Besides the obvious external changes, I’ve changed on the inside, perhaps even more drastically. For starters, I now make myself a priority. I try to make “me time” every single day and to say “no” when I’m overextending myself and making too many commitments to other people. I’m not saying it’s good to be selfish and only focus on yourself, but what I’m saying is that for me, I have more to give to others when I make time for me. Besides that, I’m much more confident and try to take active steps to make my life what I want it to be, rather than just going along for the ride. I started this blog, am actively pursuing some exciting opportunities that I’ll get to share with you soon, and have just been more proactive about my schedule and what I do with my days and time. It’s funny how they say when you try to change one thing about your life, everything else falls into place. Not only was I incredibly negligent when it came to my health, I also was very irresponsible with my financials. I’m still working on getting out of the debt I created for myself, but now I have a pretty strict budget I stick to and am much more diligent about where my money goes in addition to what I put into my body. Do you find that life changes go hand in hand for you? When you’re diligent about some things do you find other things fall into place? Beth, I really love this post! I think that there are definitely some photos that just seem to “capture the true you.” I definitely can see how uncomfortable I look in some of my before pics. And yeah, I definitely had shirts which I thought were “flattering,” but obviously couldn’t make my 240 body look like 150 pounds, haha. Wow that picture is incredible! You are a totally new person! I definitely think that when you get your act together and are diligent about things, other things tend to fall into place. Thanks for sharing with us! Great post. I can’t believe how different you look. Every time I have hung out with you, you are such a fun, confident and happy person that I can’t imagine you being any other way. People always tell me, “You don’t even look like the same person,” when they see my old photos. What I notice is how uncomfortable you look there to be having your picture taken – I have that same fake-smile in a lot of my ‘before’ photos too. Congrats – you’ve come a long way! Beth thank you for sharing this photograph! You have come so far. You are a health hero!!! Yes, when I “do the right things”: eat well, exercise, get plenty of sleep, drink lots of water, etc, I feel my best, I do well at work and my relationship with Jason is “easy” — all of things impact every aspect of my life which is why I’ve made it a focus to eat healthy and take care of myself. 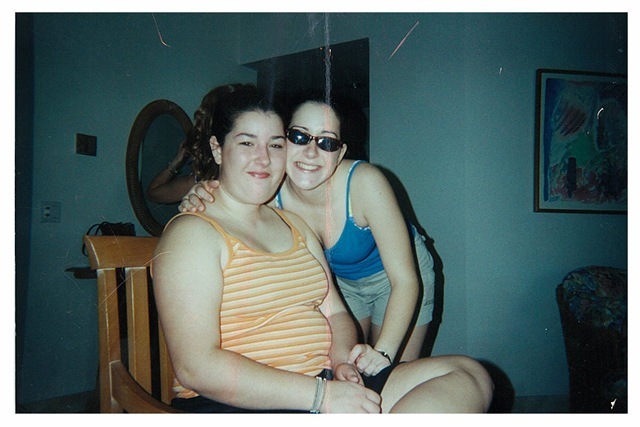 I was ALWAYS outgoing and confident, even when I was at my heaviest. But I really believe that we develop those kinds of personality traits to make up for the fact that we are the heaviest person in the room. Some people didn’t understand why I wanted to lose weight. Ha! I was happy, but it was a different kind of happiness. I feel like I’m struggling to get back to my lowest and goal, but looking at before pictures reinforces that I want it and I have to fight for it! Amazing photos. I look at old ones of me and they seem so alien now the further out I get from my heavy weight. I think when you do concentrate on getting some aspect of your life together, you tend to create more habits that align with that goal automatically. The funny thing is, you look a lot more like your sister in that photo, now! You’ve done an amazing thing with your life, and you should be proud! Such an amazing transformation Beth! You seem so full of life now & it comes through in your writing and your pictures! Even though I never met you in person, I don’t recognize the “you” I see in your before picture! I agree that life changes come hand in hand – as soon as I started focusing on living a healthy life, everything started changing – my relationship with my spouse is better, I am more outgoing & confident, we’re getting our finances back on track – everything has changed for the better! My husband’s habits are even changing – he is much more active too and is also losing weight! As a couple we are living a totally different life than we were 2 years ago – it really is amazing. Great post! I couldn’t agree more with this post. I have “older” pictures of me around the house to remind me where I have been and where I DO NOT want to go. I have one in particular that is on my fridge that I look HUGE! I still have a hard time thinking of my self as smaller (or average). I still see myself as that “FAT” girl. You are an inspiration to a lot of people! Thanks for sharing! Sometimes it’s hard for me to look at old pictures. There was a distinct time in my life where I can see myself smiling, but know exactly what’s going on in my head and how unhappy I was at the moment… funny how that works. I love this post. I can relate. I see so many old photos where I’m not smiling. I remember being okay most of the time but getting into “moods” when I was really sad about being fat. Losing the weight definitely increased my confidence! wow. just wow. This post is so inspiring, and not because of that picture. It’s because of what you’ve realized about yourself. Full disclosure: your journey is the reason I started blogging. This post just reaffirms why you are a health hero all the way in north carolina. I am usually hyper-focused on one thing at a time. As I get older I’m learning to balance things more and more. I look at pictures of me now and that is what I see only I couldn’t put my finger on it. Thank you. Talk about an “eye opener.” Your journey is so inspiring to people like me who are just starting! Love your blog! Found it a couple times in searches and am adding you to my reader. Just started a new blog to follow on my journey as I “condition myself”. Cheers! oooh i want to hear about these exciting opportunities coming up! The fact that you said the “archaic time before Facebook”makes me so happy haha. Its hard to remember like before Facebook!! What a great post! Looking back on the “old” me is hard and I still can’t believe I’ve come so far. Thanks for sharing! Wow Beth, such an amazing transformation! You are truly an inspiration and proof that hard work and dedication can get us all to where we want to be. Congratulations on being so strong and pushing through. You’re such a beautiful woman!! I love this post. It’s so insightful and genuine. You really give me hope because I’m 24 now and at the very beginning of a big weight loss, and you really inspire me that you can achieve it. Sometimes, even now only 3 weeks in, it seems like it will be such an impossible journey, so thank you for giving me hope and belief that it is possible! You have come along way and should be proud of yourself! Love the blog! Great post and so many inspiring points. I really think I have numbed out my 230+ days, and I am still working to uncover parts of that person to understand who I want to be moving forward. It is taking so much work to see that person clearly. I kind of feel like I created a web of lies about being this confident person, but see so much truth in my smile in photos. I agree that the smile reveals so much. Yes, life changes so go hand in hand. My first job out of college taught me that personal happiness is something you must take charge of and never fall victim to the misconception that things “have” to be a certain way. It was taking charge of my career and living location that domino-ed into my health and then my finances and slowly but surely that number on the scale.